(L-R) Malcolm D. Lee, Will Packer, Tiffany Haddish, Fat Joe and Kevin Hart attend the 2018 Urbanworld Film Festival on Sept. 19, 2018 in New York City. The thrill is far from gone. 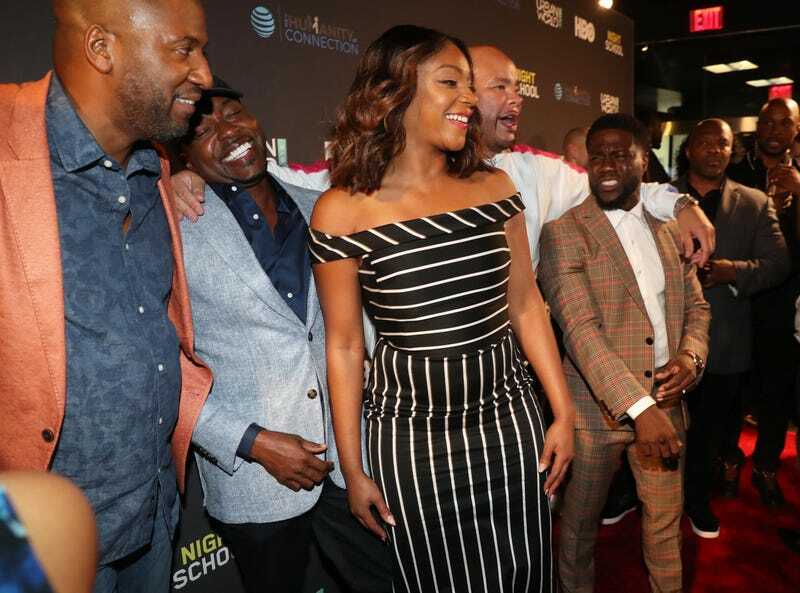 In its 22nd year, the Urbanworld Film Festival started strong with a screening of the upcoming comedy Night School, starring Kevin Hart and Tiffany Haddish and directed by Girls Trip hit-maker Malcolm D. Lee. The energy inside the AMC Empire Theatre in New York City’s Times Square was nothing short of electric on Wednesday night, as a primarily black crowd converged to see the much-touted comedy, which is the first from Hart’s Hartbeat Productions, as well as an inaugural marquee pairing between Hart and good friend Haddish, who have palpable chemistry on screen. “I’m just having fun,” Haddish told E! Television’s cameras of her ever-evolving career. The recent Emmy winner and our designated winner of New York Fashion Week looked sleek in a black-and-white bodycon dress by in-demand designer Christian Siriano. And fun was the theme of the evening, as Haddish introduced the film by playing hype woman to the Urbanworld audience as she walked down the main aisle of the movie theater, tossing quips at the audience. Moderator Elaine Welteroth and producer Will Packer speak at the Q&A follwing the premiere of Night School during the 2018 Urbanworld Film Festival on September 19, 2018 in New York City. After the screening, acclaimed journalist Elaine Welteroth (wearing a fierce floral pantsuit and black leather beret) moderated a talk for the crowd, which included director Lee and producer Will Packer, who was subsequently named one of Hollywood Reporter’s Most Powerful People in Entertainment for 2018 on Thursday morning. Packer confirmed that Night School was actually Hart’s idea, and was in the works prior to him and Lee’s blockbuster hit, Girls Trip. Night School will predictably be another hit for Packer and Lee, but it’s just the start of the Urbanworld Film Festival, which will also screen the highly anticipated The Hate U Give and Widows this week.